In short: it's time to think about the Internet instead of just letting it happen. Edge was in Munich in January for DLD 2010 and an Edge/DLD event entitled "Informavore" — a discussion featuring Frank Schirrmacher, Editor of the Feuilleton and Co-Publisher of Frankfurter Allgemeine Zeitung, Andrian Kreye, Feuilleton Editor of Sueddeutsche Zeitung, Munich; and Yale computer science visionary David Gelernter, who, in his 1991 book Mirror Worlds presented what's now called "cloud computing." The intent of the panel was to discuss — for the benefit of a German audience — the import of the recent Frank Schirrmacher interview on Edge entitled "The Age of the Informavore." David Gelernter, who predicted the Web, and who first presented the idea of "the cloud", was the scientist on the panel along with Schirrmacher and Kreye, Feuilleton editors of the two leading German national newspapers, both distinguished intellectuals. Those of us involved in communicating ideas need to re-think the Internet. Here at Edge, we are not immune to such considerations. We have to ask if we're kidding ourselves by publishing 10,000+ word pieces to be read by people who are limiting themselves to 3" ideas, i.e. the width of the screen of their iPhones and Blackberries. Many of the people that desperately need to know, don't even know that they don't know. Book publishers, confronted by the innovation of technology companies, are in a state of panic. Instead of embracing the new digital reading devices as an exciting opportunity, the default response is to disadvantage authors. Television and cable networks are dumbfounded by the move of younger people to watch TV on their computers or cell-phones. Newspapers and magazine publishers continue to see their advertising model crumble and have no response other than buyouts. So what's the point? It's a culture. Call it the algorithmic culture. To get it, you need to be part of it, you need to come out of it. Otherwise, you spend the rest of your life dancing to the tune of other people's code. Just look at Europe where the idea of competition in the Internet space appears to focus on litigation, legislation, regulation, and criminalization. The Internet is no topic like cellphones or videogame platforms or artificial intelligence; it's a topic like education. It's that big. Therefore beware: to become a teacher, master some topic you can teach; don't go to Education School and master nothing. To work on the Internet, master some part of the Internet: engineering, software, computer science, communication theory; economics or business; literature or design. Don't go to Internet School and master nothing. There are brilliant, admirable people at Internet institutes. But if these institutes have the same effect on the Internet that education schools have had on education, they will be a disaster. It is just about 10 years since Edge and FAZ co-published Gelernter's June, 2000 manifesto, "A Second Coming", which was widely read and debated. I expect nothing less for this powerful and provocative piece by one of the leading visionaries of the cybersphere. I welcome comments and look forward to a rich Reality Club discussion. 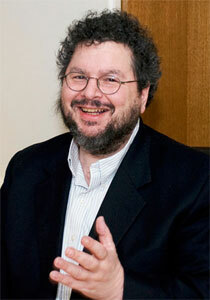 DAVID GELERNTER is a professor of computer science at Yale and chief scientist at Mirror Worlds Technologies (New Haven). His research centers on information management, parallel programming, and artificial intelligence. The "tuple spaces" introduced in Nicholas Carriero and Gelernter's Linda system (1983) are the basis of many computer communication systems worldwide. He is the author of Mirror Worlds, and Drawing a Life: Surviving the Unabomber. The Edge Annual Question 2010: "How Is The Internet Changing the Way You Think?" 1. No moment in technology history has ever been more exciting or dangerous than now. The Internet is like a new computer running a flashy, exciting demo. We have been entranced by this demo for fifteen years. But now it is time to get to work, and make the Internet do what we want it to. 2. One symptom of current problems is the fundamental puzzle of the Internet. (Algebra and calculus have fundamental theorems; the Internet has a fundamental puzzle.) If this is the information age, what are we so well-informed about? What do our children know that our parents didn't? (Yes they know how to work their computers, but that's easy compared to — say — driving a car.) I'll return to this puzzle. 3. Here is a simpler puzzle, with an obvious solution. Wherever computers exist, nearly everyone who writes uses a word processor. The word processor is one of history's most successful inventions. Most people call it not just useful but indispensable. Granted that the word processor is indeed indispensable, what good has it done? We say we can't do without it; but if we had to give it up, what difference would it make? Have word processors improved the quality of modern writing? What has the indispensable word processor accomplished? 4. It has increased not the quality but the quantity of our writing — "our" meaning society's as a whole. The Internet for its part has increased not the quality but the quantity of the information we see. Increasing quantity is easier than improving quality. Instead of letting the Internet solve the easy problems, it's time we got it to solve the important ones. 5. Consider Web search, for example. Modern search engines combine the functions of libraries and business directories on a global scale, in a flash: a lightning bolt of brilliant engineering. These search engines are indispensable — just like word processors. But they solve an easy problem. It has always been harder to find the right person than the right fact. Human experience and expertise are the most valuable resources on the Internet — if we could find them. Using a search engine to find (or be found by) the right person is a harder, more subtle problem than ordinary Internet search. Small pieces of the problem have been attacked; in the future we will solve this hard problem in general, instead of being satisfied with windfalls and the lowest-hanging fruit on the technology tree. 6. We know that the Internet creates "information overload," a problem with two parts: increasing number of information sources and increasing information flow per source. The first part is harder: it's more difficult to understand five people speaking simultaneously than one person talking fast — especially if you can tell the one person to stop temporarily, or go back and repeat. Integrating multiple information sources is crucial to solving information overload. Blogs and other anthology-sites integrate information from many sources. But we won't be able to solve the overload problem until each Internet user can choose for himself what sources to integrate, and can add to this mix the most important source of all: his own personal information — his email and other messages, reminders and documents of all sorts. To accomplish this, we merely need to turn the whole Cybersphere on its side, so that time instead of space is the main axis. 7. In the last paragraph I wrote "each Internet user"; but users of any computing system ought to have a simple, uniform operating system and interface. Users of the Internet still don't. 8. Practical business: who will win the tug of war between private machines and the Cloud? Will you store your personal information on your own personal machines, or on nameless servers far away in the Cloud, or both? Answer: in the Cloud. The Cloud (or the Internet Operating System, IOS — "Cloud 1.0") will take charge of your personal machines. It will move the information you need at any given moment onto your own cellphone, laptop, pad, pod — but will always keep charge of the master copy. When you make changes to any document, the changes will be reflected immediately in the Cloud. Many parts of this service are available already. 9. Because your information will live in the Cloud and only make quick visits to your personal machines, all your machines will share the same information automatically; a new machine will be useful the instant you switch it on; a lost or stolen machine won't matter — the information it contains will evaporate instantly. The Cloud will take care that your information is safely encrypted, distributed and secure. 10. Practical business: small computers have been the center of attention lately, and this has been the decade of the cellphone. Small devices will continue to thrive, but one of the most important new developments in equipment will be at the other end of the size spectrum. In offices and at home, people will increasingly abandon conventional desktop and laptop machines for large screen computers. You will sit perhaps seven feet away from the screen, in a comfortable chair, with the keyboard and controls in your lap. Work will be easier and eyestrain (which is important) will decrease. Large screen computers will change the shape of office buildings and create their own new architecture. Office workers will spend much of their time in large-screen computer modules that are smaller than most private offices today, but more comfortable. A building designed around large-screen computers might have modules (for example) stacked in many levels around a central court; the column whose walls consist of stacked modules might spiral helically as it rises…. 11. The Internet will never create a new economy based on voluntary instead of paid work — but it can help create the best economy in history, where new markets (a free market in education, for example) change the world. Good news! — the Net will destroy the university as we know it (except for a few unusually prestigious or beautiful campuses). The net will never become a mind, but can help us change our ways of thinking and change, for the better, the spirit of the age. This moment is also dangerous: virtual universities are good but virtual nations, for example, are not. Virtual nations — whose members can live anywhere, united by the Internet — threaten to shatter mankind like glass into razor-sharp fragments that draw blood. We know what virtual nations can be like: Al Qaeda is one of the first. 12. In short: it's time to think about the Internet instead of just letting it happen. 13. The traditional web site is static, but the Internet specializes in flowing, changing information. The "velocity of information" is important — not just the facts but their rate and direction of flow. Today's typical website is like a stained glass window, many small panels leaded together. There is no good way to change stained glass, and no one expects it to change. So it's not surprising that the Internet is now being overtaken by a different kind of cyberstructure. 15. Every month, more and more information surges through the Cybersphere in lifestreams — some called blogs, "feeds," "activity streams," "event streams," Twitter streams. All these streams are specialized examples of the cyberstructure we called a lifestream in the mid-1990s: a stream made of all sorts of digital documents, arranged by time of creation or arrival, changing in realtime; a stream you can focus and thus turn into a different stream; a stream with a past, present and future. The future flows through the present into the past at the speed of time. 16. Your own information — all your communications, documents, photos, videos — including "cross network" information — phone calls, voice messages, text messages — will be stored in a lifestream in the Cloud. 17. There is no clear way to blend two standard websites together, but it's obvious how to blend two streams. You simply shuffle them together like two decks of cards, maintaining time-order — putting the earlier document first. Blending is important because we must be able to add and subtract in the Cybersphere. We add streams together by blending them. Because it's easy to blend any group of streams, it's easy to integrate stream-structured sites so we can treat the group as a unit, not as many separate points of activity; and integration is important to solving the information overload problem. We subtract streams by searching or focusing. Searching a stream for "snow" means that I subtract every stream-element that doesn't deal with snow. Subtracting the "not snow" stream from the mainstream yields a "snow" stream. Blending streams and searching them are the addition and subtraction of the new Cybersphere. 18. Nearly all flowing, changing information on the Internet will move through streams. You will be able to gather and blend together all the streams that interest you. Streams of world news or news about your friends, streams that describe prices or auctions or new findings in any field, or traffic, weather, markets — they will all be gathered and blended into one stream. Then your own personal lifestream will be added. The result is your mainstream: different from all others; a fast-moving river of all the digital information you care about. 19. You can turn a knob and slow down your mainstream: less-important stream-elements will flow past invisibly and won't distract you, but will remain in the stream and appear when you search for them. You can rewind your lifestream and review the past. If an important-looking document or message sails past and you have no time to deal with it now, you can copy the document or message into the future (copy it to "this evening at 10," say); when the future arrives, the document appears again. You can turn a different knob to make your fast-flowing stream spread out into several slower streams, if you have space enough on your screen to watch them all. And you can gather those separate streams back together whenever you like. 20. Sometimes you will want to listen to your stream instead of watching it (perhaps while you're driving, or sitting through a boring meeting or lecture). Software will read text aloud, and eventually will describe pictures too. When you watch your high-definition TV, you might let the stream trickle down one side of the screen, so you can stay in touch with your life. 21. It's simple for the software that runs your Lifestream to learn about your habits; simple to figure out which emails (for example), or social updates, or news stories, you are likely to find important and interesting. It will therefore be easy for software to highlight the stream elements you're apt to find important, and let the others rush by quickly without drawing your attention. 22. Lifestreams will make it even easier than it is today for software to learn the details of your life and predict your future actions. The potential damage to privacy is too large and important a problem to discuss here. Briefly, the question is whether the crushing blows to privacy from many sources over the last few decades will make us crumple and surrender, or fight harder to protect what remains. 24. Ten years ago I wrote about the growing importance of lifestreams. Last year, the technology journalist Erik Schonfeld asked in a news story whether a certain large company "can take the central communication model of social networks — the lifestream — and pour it back into its IM clients." (The story was headlined "Bebo Zeroes In On Lifestreaming For The Masses.") "Lifestreaming" is a word that is now used generically, and streams are all over the net. Ten years ago I described the computer of the future as a "scooped-out hole in the beach where information from the Cybersphere wells up like seawater." Today the spread of wireless coverage and the growing power of mobile devices means that information does indeed well up almost anywhere you switch on your laptop or cellphone; and "anywhere" will be true before long. 25. From which we learn that (a) making correct predictions about the technology future is easy, and (b) writers should remember to put their predictions in suitably poetic language, so it's easy to say they were right. 26. The Internet is no topic like cellphones or videogame platforms or artificial intelligence; it's a topic like education. It's that big. Therefore beware: to become a teacher, master some topic you can teach; don't go to Education School and master nothing. To work on the Internet, master some part of the Internet: engineering, software, computer science, communication theory; economics or business; literature or design. Don't go to Internet School and master nothing. There are brilliant, admirable people at Internet institutes. But if these institutes have the same effect on the Internet that education schools have had on education, they will be a disaster. 27. Returning to our fundamental riddle: if this is the information age, what do our children know that our parents didn't? The answer is "now." They know about now. 28. Internet culture is a culture of nowness. The Internet tells you what your friends are doing and the world news now, the state of the shops and markets and weather now, public opinion, trends and fashions now. The Internet connects each of us to countless sites right now — to many different places at one moment in time. 29. Nowness is one of the most important cultural phenomena of the modern age: the western world's attention shifted gradually from the deep but narrow domain of one family or village and its history to the (broader but shallower) domains of the larger community, the nation, the world. The cult of celebrity, the importance of opinion polls, the decline in the teaching and learning of history, the uniformity of opinions and attitudes in academia and other educated elites — they are all part of one phenomenon. Nowness ignores all other moments but this. In the ultimate Internet culture, flooded in nowness like a piazza flooded in sea water, drenched in a tropical downpour of nowness, everyone talks alike, dresses alike, thinks alike. 30. As I wrote at the start of this piece, no moment in technology history has ever been more exciting or dangerous than "now." As we learn more about now, we know less about then. The Internet increases the supply of information hugely, but the capacity of the human mind not at all. (Some scientists talk about artificially increasing the power of minds and memories — but then they are no longer talking about human beings. They are discussing some new species we know nothing about. And in this field, we would be fools to doubt our own ignorance.) The effect of nowness resembles the effect of light pollution in large cities, which makes it impossible to see the stars. A flood of information about the present shuts out the past. 31. But — the Internet could be the most powerful device ever invented for understanding the past, and the texture of time. Once we understand the inherent bias in an instrument, we can correct it. The Internet has a large bias in favor of now. Using lifestreams (which arrange information in time instead of space), historians can assemble, argue about and gradually refine timelines of historical fact. Such timelines are not history, but they are the raw material of history. They will be bitterly debated and disputed — but it will be easy to compare two different versions (and the evidence that supports them) side-by-side. Images, videos and text will accumulate around such streams. Eventually they will become shared cultural monuments in the Cybersphere. 32. Before long, all personal, familial and institutional histories will take visible form in streams. A lifestream is tangible time: as life flashes past on waterskis across time's ocean, a lifestream is the wake left in its trail. Dew crystallizes out of the air along cool surfaces; streams crystallize out of the Cybersphere along veins of time. As streams begin to trickle and then rush through the spring thaw in the Cybersphere, our obsession with "nowness" will recede, the dykes will be repaired and we will clean up the damaged piazza of modern civilization. 33. Anyone who has ever looked through a telescope at the moon close-up has seen it drift out of sight as the earth slowly spins. In the future, the Cybersphere will drift too: if you have investigated one topic long enough for your attention to grow slack and your mind to wander, the Net will respond by letting itself drift slowly into new topics, new domain: not ones with obvious connections to the topic you've been studying; new topics that have deep emotional connections to the previous ones, connections that will no doubt make sense only to you. 34. The Internet today is, after all, a machine for reinforcing our prejudices. The wider the selection of information, the more finicky we can be about choosing just what we like and ignoring the rest. On the Net we have the satisfaction of reading only opinions we already agree with, only facts (or alleged facts) we already know. You might read ten stories about ten different topics in a traditional newspaper; on the net, many people spend that same amount of time reading ten stories about the same topic. But again, once we understand the inherent bias in an instrument, we can correct it. One of the hardest, most fascinating problems of this cyber-century is how to add "drift" to the net, so that your view sometimes wanders (as your mind wanders when you're tired) into places you hadn't planned to go. Touching the machine brings the original topic back. We need help overcoming rationality sometimes, and allowing our thoughts to wander and metamorphose as they do in sleep. 35. Pushing the multi-mega-ton jumbo jet of human thought-style backwards a few inches, back in the direction of dream logic, might be the Internet's greatest accomplishment. The best is yet to be.